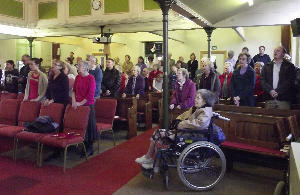 Our church is a caring church with a real sense of family and unity. 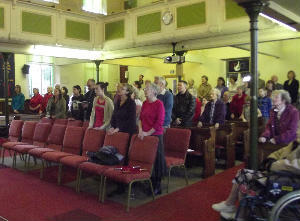 We enjoy Praise and Worship in both music and singing with sound Bible teaching. 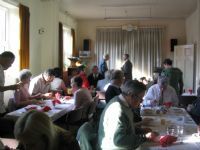 The fellowship of the church also meet socially for meals together, social events, quiz nights and church walks for the fitter amongst us. The ministry is firmly based on the authority of Scripture with an emphasis on evangelism and a vision for growth rather than ‘maintenance'. Our church is part of 'Churches Together in Shepshed', which consists of 4 churches in the town, Charnwood Road (Baptist), St Botolph's (CofE), Christchurch (Methodist) and St Winefride's (Catholic). Representatives of the churches meet regularly to exchange views and information and to plan joint services and events such as the Lent Course and the 'Silent Walk of Witness' around Shepshed on Good Friday. We are part of the Soar Valley Gospel Partnership which also includes the following Baptist Churches - Barrow, Castle Donnington, Hathern, Kegworth, Loughborough, Mountsorrel, Quorn, Rothley, and Sutton Bonnington. 2. That Christian Baptism is the immersion in water into the Name of the Father, the Son, and the Holy Ghost, of those who have professed repentance towards God and faith in our Lord Jesus Christ who "died for our sins according to the Scriptures; was buried, and rose again the third day".